A sky-loving park ranger dares to dive deep into the earth—and learns to love it. In 1995, Doug Thompson, a veteran National Park Service ranger, began a six-year stint at Carlsbad Caverns. Until then, he had never ventured below the earth and, as a youngster visiting the national park, had succumbed to a terror so supreme that he spent the entire trip in the aboveground gift shop. 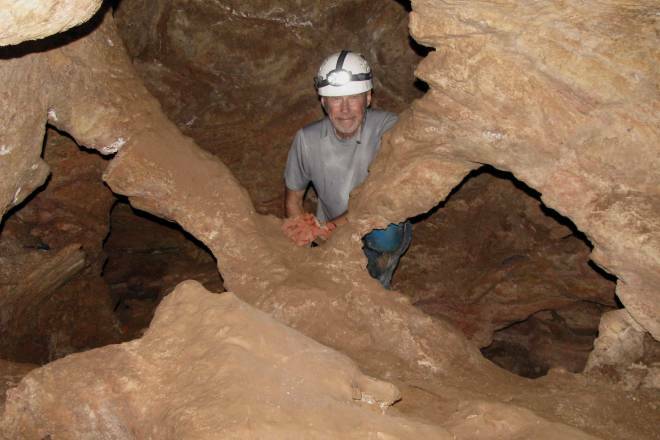 As a ranger, he soon acclimated to the popular Big Room and also learned caving techniques that took him into many of the park’s more than 120 known caves—sometimes fearfully, but always enthralled. Now retired and living in Capitán, Thompson last year published his experiences in Underground Ranger: Adventures in Carlsbad Caverns National Park and Other Remarkable Places (UNM Press). In it, he manages to carry Milton, Haydn, Mozart, and Native creation stories into his deepening love for underground spaces. His memories include trips with fellow rangers into remote stretches of the Guadalupe Mountains—aka the “High Guads”—beyond the national park in the Lincoln National Forest. Here’s a memory of one such experience, excerpted from the book. IT WAS A BEAUTIFUL NAME: “Cave of the Madonna.” I repeated it to myself as we drove along the highway through Dark Canyon in Lance Mattson’s and Pete Norris’ pickup trucks, heading for the dirt roads on the northwest side of the High Guads. Our destination was Guadalupe Ridge, where we were going to camp. Because the night was overcast and exceptionally cold with a chance of snow in the forecast, I wasn’t looking forward to camping, but I was eager to take on the cave. Lance said we would be making two long drops—the first almost 26 stories and the second almost 17—to reach an area of the cave known as the Wine Cellar, which contained some of the finest and most imposing formations in the Guadalupe Mountains. By the time we reached the isolated community of Queen—a U.S. Forest Service office, a small restaurant, and several houses scattered among the junipers above Gilson Canyon—we were encountering light rain and occasional snow flurries. The canyon took its name from G.B. Gilson, a 43-year-old homesteader who was murdered by unknown assailants in 1883. His barely legible tombstone can still be seen near the canyon’s dry wash and the crumbling remains of what was apparently his small rock home. A few miles beyond Queen, we turned off the highway onto the first of several dirt roads that would take us into the higher elevations and, suddenly, found ourselves churning through a quagmire of thick mud. The next hour was a tedious and seemingly endless trial of bone-knocking jolts as our pickups lurched along muddy ruts and scraped across boulder-choked washes toward the steep climb that would take us to the top of Guadalupe Ridge. When we finally slid to a stop in the murky darkness, the rain had stopped, but it was so cold that we decided to bed down quickly. Unloading our gear from the trucks, we crawled into our sleeping bags. During the night, we awoke to find ourselves covered with almost an inch of very wet snow. Morning light brought my first glimpse of the High Guads. There was a deserted fire tower several hundred yards back along the road, and a sweeping view toward the open desert to the southeast. Our isolation was palpable: Queen was a grueling hour’s drive away, and the nearest gas station and hospital were another hour beyond that. The area confirmed my belief that the High Guads must be one of the loneliest places in the Southwest, even when you’re with friends. After a hasty breakfast, we piled into Lance’s pickup and drove another couple of bumpy miles along the crest of the ridge until Lance finally pulled over. Because the cave was located in the side of a rocky canyon, we had to hike along a secondary ridge and then down a steep limestone slope for about a mile to reach the entrance. The trail gradually became so indistinct that I had to wonder how Lance was able to find his way, but eventually we arrived at a nondescript opening in the rocks. THE CAVE TOOK its name from a small formation just inside the entrance that was supposed to look like the Madonna and her sleeping child. I thought that was a stretch; it didn’t look like much of anything to me. Beyond the formation, we got down on our hands and knees and followed Lance into a low, cramped passage that made a series of confusing turns before bringing us to the first drop—an innocuous vertical joint running across the floor with a short slope leading to its edge. Despite its benign appearance, I was beginning to feel apprehensive again; at 26 stories, this would be my longest rappel yet and my first in complete darkness. Lance and Pete worked on the anchor while the rest of us put on our climbing gear. With the anchor secured, Pete attached himself to the rope and went down first, followed by Lance and Beth Milner. I had already clipped onto the rope with my safety and was waiting for Beth’s cry of “Off rope!” when I suddenly heard her screaming at the top of her lungs far below—apparently just to create an echo. When she finally touched down and shouted that she was clear, I slowly eased over the edge. When I felt my weight resting safely on the rope, my apprehension vanished. I descended the narrow joint for what seemed like a long time—that part of the drop was about 10 stories—using my feet to push myself away from the wall. When I finally emerged at the bottom, I was hanging freely above a massive chamber with nothing below but absolute darkness. Pete, Lance, and Beth were waiting about 16 stories down. The darkness was astounding. It had been there for millions of years—the darkness of the underworld. At the bottom of the second drop, the Wine Cellar sloped away from us at a steep angle. Lance said almost everyone called it the “Whine Cellar” because it took so much effort to get there. It appeared to be a large chamber with a relatively low ceiling, and I was eager to start exploring. Heading down the marked trail, we began to encounter “totem poles”—stalagmites so fantastically tall and slender that they looked like bony fingers pointing toward the upper world. We seemed to be walking through a forest of giant toothpicks. When stalagmites have no corresponding stalactites overhead—like the totem poles—it often means the water has been dripping fairly rapidly; because it stays on the ceiling for only a short time, it carries most of its calcite to the floor, where it creates stalagmites. The reverse also is true: If water drips slowly and stays on the ceiling for a relatively long time, stalactites tend to form. When we reached the end of the trail, we found amazing formations. An elegant ledge of thick “shelfstone” protruded from the walls all around the chamber, indicating that a large pool of water had once covered the floor; the shelfstone had formed along its edges at the waterline. Yet the pool hadn’t been there initially. Many thick columns connected the floor to the ceiling, showing the floor had been dry when they formed, and each column displayed a graceful ledge of shelfstone around its middle, at the waterline of the later pool. Imagine sticking a pencil through the center of a disk of cardboard about two inches in diameter, then holding the pencil upright with the cardboard disk positioned about a third of the way up from the bottom. That’s what the columns looked like, and that’s why they were called “candlestick” formations. Why had the pool disappeared? Probably because the caves of the Guadalupe Mountains are relatively dry now, or “dormant,” compared with what they were like at the end of the last ice age, about seven to ten thousand years ago. We spent the entire day in the cave. When we finally emerged, after saying goodbye to the Madonna and her child, we discovered a bitterly cold night and a brilliant half-moon that flooded the canyon with its light. I carried one of the ropes slung over my shoulder as we hiked back to the truck. The view into the canyon by moonlight was one of the loveliest I had ever seen, with pale-blue limestone cliffs and slopes rising starkly above dark cottonwood trees in the canyon bottoms. It was my first night exit from a cave, and it couldn’t have been more beautiful. When we finally reached the top of the ridge, I had fallen well behind the others and was breathing heavily, but the hard climb and cold wind had been worth it. I WENT ON TO VISIT a number of other caves in the High Guads over the next few years, including Black Cave, Cave of the Bell—which I helped survey for the U.S. Forest Service—Cottonwood Cave, Gunsight Cave, Hell Below, Hidden Cave, Red Lake Cave, and Virgin Cave. I eagerly headed up the slope. After climbing about 20 yards, I came to a shallow pool of water. Because I couldn’t go any farther, Dave’s strand of spider web had to be nearby, so I crouched low and began bobbing my head around to scan the area with my helmet lamp. I spotted it about a foot above the floor, then did a double take. Was that what I thought it was? Slowly moving the palm of my hand through the spider web, I found it didn’t break. Instead, I felt a momentary coolness against my skin. When I passed my hand through it a second time, the same thing happened. It wasn’t a strand of spider web at all. It was a microscopically thin jet of water shooting all the way across the joint from one wall to the other. Hydrostatic pressure was forcing it out of the limestone so rapidly that no helictite could form, through a pore so tiny I couldn’t even see it. It was one of the most amazing things I had ever seen. In Pilgrim at Tinker Creek—a must-read for anyone who loves the natural world—Annie Dillard quotes a 16th-century alchemist who wrote of the philosophers’ stone, “One finds it in the open country, in the village and in the town. It is in everything which God has created. Maids throw it in the street. Children play with it.” The same is true of nature’s creative spirit. If we climb the mountains like John Muir, we find it in the sunshine, the trees, and the blowing winds. If we descend into the earth, we find it hidden in the darkness and the silence of the caves, waiting to speak to us.